Really, all hiking trails are exercise trails but the ones we’re going to talk about in this post are for the exercise enthusiast looking to track their goals over time. These trails aren’t necessarily known for their beauty or scenery either, it’s all about pace and time to the finish (and maybe bragging rights too). These trails are great for getting into shape before heading out to attempt the larger July and August hikes. The 1/4 mark on the Grouse Grind on a rainy day. The Grouse Grind is the most widely known “exercise” trail and has even become an attraction for those visiting Vancouver. The Grind starts from the base of the gondola and climbs 853 meters in 2.9km. There are a few organized races on the trail each year with the record time clocking in at around 27-minutes. The trail is only open when it’s clear of snow, which is approximately June – October but varies depending on the amount of snowfall for the season. The cost of taking the gondola back down is $10 (annual passes are available). The BCMC Trail near the Grind also goes to the top of Grouse Mountain. The BCMC Trail is right next to the Grouse Grind and starts and ends at the same place. It’s gaining in popularity because it’s not as busy as the Grind and is actually more of a trail and less stairs (the Grouse Grind used to be a trail in the 90’s before Metro Vancouver had to reinforce the route due to so many people hiking it and causing erosion along the path). There are no views, no scenic sites, just a pure climb to the top. The start of the trail is at the beginning of the Grouse Grind but forks to the right after passing through the gate. The view of Squamish near the top of The Chief. The Chief might be the one exception to the above trails as it provides both exercise and an incredible view of Howe Sound from the top on a clear sunny day. 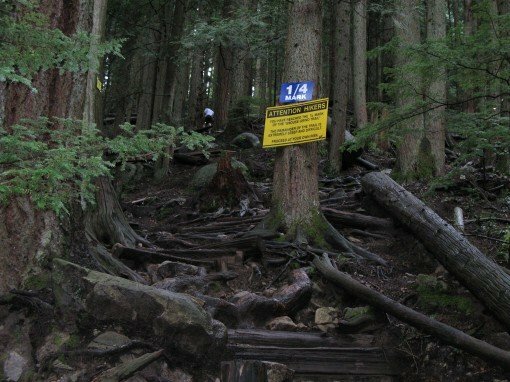 We’ve included it on this list because, just like the Grouse Grind, it has become very popular with a good portion of the route having been reinforced with stairs instead of being a trail. Steps along the Upper Shannon Falls Trail that connects to the Sea To Sky Gondola. We weren’t going to mention Upper Shannon Falls but with the recent addition from the top of the trail of a connecting trail to the Sea To Sky gondola, it seems that this route is becoming Squamish’s Grind. Exercise buffs will be able to run up the trail and then take the Gondola back down. From just beyond the rocky bluff where the Upper Shannon Falls trail ended, the trail splits into 2 routes that end at the top of the Gondola. Going left takes you up the Wrinkle Rock Trail, which is a very steep, challenging trail up a large rock. Alternatively, going right takes you up the Upper Sea To Summit Trail at an easier pace. The cost of taking the gondola back down is $10 per ticket (annual passes are also available). Not known for its beauty, the Coquitlam Crunch follows underneath a set of powerlines. 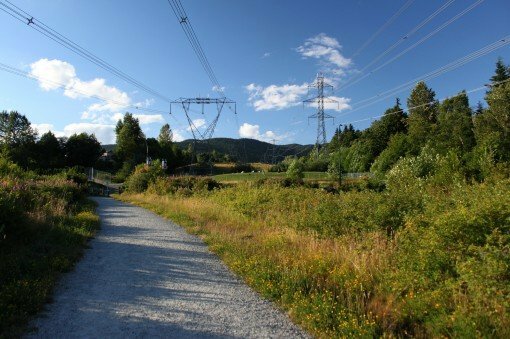 This trail for the Coquitlam Crunch is a mixture of gravel and paved trails that follows under a set of power lines up. This is a good after work exercise route and one that’s popular with the locals, however the terrain is not very exciting and I wouldn’t recommend going out of your way to experience this route. Burnaby Mountain Trails off of North Road. 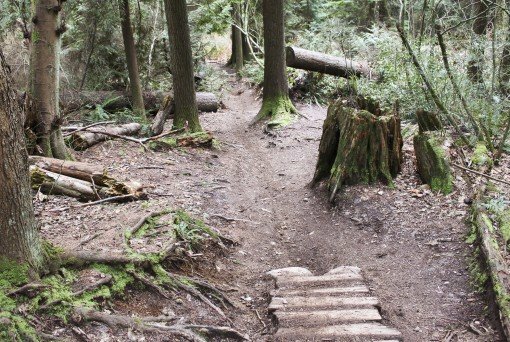 There are several option on Burnaby Mountain with trails that go up from several locations. The two best options are the Velodrome Trail and the North Road Trails. The Velodrome Trail starts from the Barnet Highway, next to the Velodrome, and climbs steeply up 518 stairs (as I counted) before reaching a connector trail that takes you to the totem poles at Horizons. This is a great workout and the top offers a great view looking towards Indian Arm on a clear, sunny day. The North Road Trails start along North Road and offer a network of trails that are shared with mountain bikers. A popular exercise route is to hike up to the wooden map board under the powerlines, then veer left following the Trans Canada Trail up to SFU, a route that is sometimes referred to as Cardiac Arrest. Steps along the route to Jug Island in Belcarra. The trail to Jug Island Beach is a fun route that begins in Belcarra and takes you uphill, through the forest before descending down a steep hill and arriving at a beach. The variety of terrain and relatively short distance makes this route an enjoyable morning excursion. The Harrison Grind is rugged but there’s a nice view near the top. 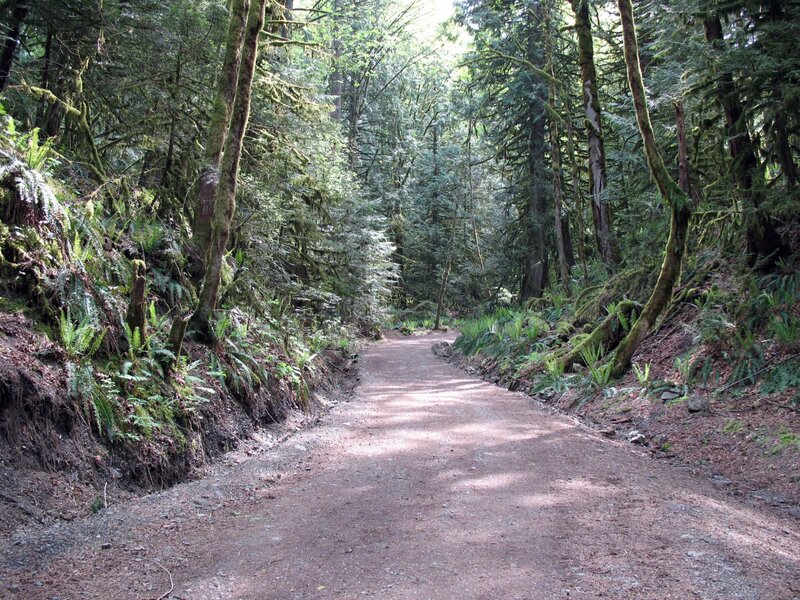 Located in the community of Harrison Lake, their version of the Grouse Grind is more challenging for 2 reasons: first, the trail is very rugged and overgrown in many parts, and second, you have to hike back down. You won’t find tonnes of people hiking this trail either but it does have a great view of Harrison Lake from the top. After the viewpoint, you can continue along a flat, often muddy section to Campbell Lake, although the lake itself is not very exciting. Teapot Hill starts with a steep climb up a gravel road. Located near Cultus Lake in Chilliwack, the trail to Teapot Hill is fairly short but climbs steeply from the get-go. At the top, a viewpoint looks towards the south through a clearing in the trees. Enjoy before heading back down. Near the top of Mount Thom in Chilliwack, BC. The route up Mount Thom from Sylvan Drive in Chilliwack is popular with locals and dog walkers. It has its steep sections but largely weaves through several switchbacks as you make your way towards the junction with the loop at the top. Or, you can always park at the top on Churchill Parkway and just do the short loop, but that would feel a bit like cheating. Do you have a favourite exercise trail? Let us know. A great one out in South Delta is: Fred Gingell. Located at 265 English Bluff Road, Tsawwassen, BC. Some locals refer to it as the “tsawwassen grind.” Depending on fitness level it can take 5 minutes round trip (down then back up) or up to 15 minutes. This is a lookout park with a stair case+trail like switchbacks down to Tsawwassen Beach. When you reach the bottom you will face west towards to ferry terminal. It offers a great workout for every fitness level, since you can do it as many times as you want. There are even a few benches along the way to rest. Regulars sometimes do up to 10 sets, or spend an hour going down and up again.